Private Sam Hitchen, of the Cheshires, the old Lostock Gralam and Witton Albion footballer, is engaged in the “greater game” in France, and, in the course of a letter full of football terms, which he has written to his mother […] he gives a vivid account of a charge upon the Germans. “[…] As the Germans continued to send whizz bangs, coal boxes and Jack Johnsons we stayed in [some shallow trenches] for a few hours. […] Some of the German shells—we call them whizz bangs—just skim the top of the trenches. We cannot hear them until they pass, and they make terrific row when they explode, and nearly bury us with earth.” – Chester Chronicle, 31 July 1915. Real live ‘whizz bangs’ were not a source of laughter, fun, jollity, frivolity, or merriment for soldiers on the front line in France or Belgium. But the term adopted by the British ‘Tommy’ to describe the shells fired by ‘Fritz’ was eventually acquired by a concert party of the Fifth Division, who performed at Fonquevillers in December 1916. 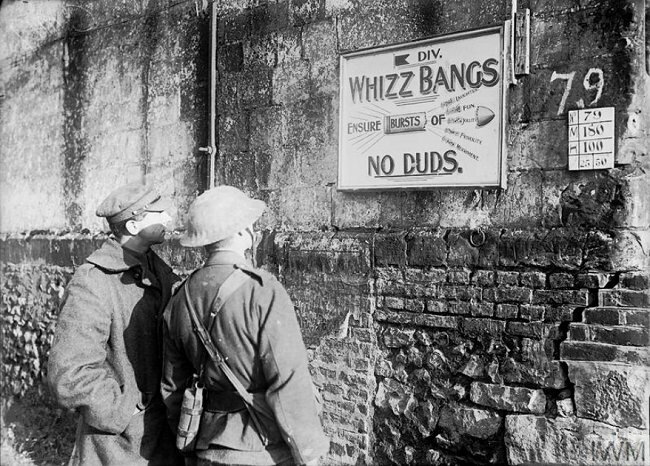 Their advertising boards , one of which can be seen in the photo above, promised audiences all the things that real whizz bangs were not – and no duds! The phrase came back to Britain, in letters like that written by Private Sam Hitchen, and no doubt with the wounded soldiers who returned home for hospital treatment (some of whom Hope [ ] and Hester [ ] would have spoken to in their work as VAD nurses). So when the Atcherley sisters and a few of their friends formed their own concert party, to entertain people in and around Chester during the Great War, it probably didn’t take them long to decide that they should make “Whizz Bang” a part of their troupe’s name. It seems likely that the Whizz Bang Pierrot Concert Party, also known simply as the Whizz Bangs, developed from entertainments in which some of its members had participated in their capacity as Girl Guide troop leaders. A report in the Chester Chronicle of 26 February 1916 stated that “The local Baden Powell Girl Guides arranged two excellent variety entertainments in aid of the Baden Powell Girl Guide Funds and the Serbian Relief funds. The report noted that “The Saltney Guides gave a very successful performance of a children’s play entitled ‘Christmas Eve,’ comprising pretty scenes connected with the arrival of ‘Father Christmas,’ songs, dances, etc., and was especially written by Miss Atcherley, the chief officer of the Saltney troop.” A play by adults was also “capitally performed”, and featured Miss Atcherley and Miss “Esther” (Hester) Atcherley, along with the Misses Napier who would later perform with the Atcherley sisters in the Whizz Bangs. The programme included opening chorus, “Laugh, and the world laughs with you,” the troupe; trio, Misses Grantham, Ayrton and Huleatt; song, “Catch me,” Miss Napier; duet, “Home of the Hun,” Misses Joliffe and Atcherley; song, “Five and twenty sailor men,” Mr. H. Dent; song, “A perfect day,” Miss Huleatt; “The Kipling walk,” the troupe; duet, “Oh, no, John!” Misses Grantham and Napier; song, “For you alone,” Mr. Dent; song, “Blighty,” Miss Grantham; chorus, “My moon,” the troupe; song, “Dear little jammy face,” Miss Huleatt; song, “If you were the only girl in the world,” Miss Huleatt; duett, “The twins,” Miss Napier and Mr. Dent. The concert concluded with a laughable sketch entitled “Aunt Belinda’s Burglar,” in which the characters were admirably sustained by Miss Grantham (Aunt Belinda), Miss M. Atcherley (niece), Miss C. Joliffe (Sarah, a servant), and Miss H. Atcherley (burglar). Thanks are due to the party for providing such an entertaining evening. Miss M Atcherley was most likely Mary Elizabeth Hope, referred to by her proper first initial, while Miss H would have been Hester. Two months later, the concert party was being referred to as the Whizz Bang Pierrot Troupe. According to the Imperial War Museums, Pierrots were “popular with military concert parties during the First World War.” The Peirrot costume and performance seems to have made its way across the Channel to Blighty in the same way as the phrase ‘whizz bang’, and just as readily adopted. Strictly speaking Chester’s Whizz Bang Troupe, being all-female, were actually Pierrettes. Whether they looked anything like those in the photo below, pictured in London while collecting money for wounded soldiers in 1915, we may never know. RED CROSS WORK IN CHESHIRE. The President of the Cheshire branch of the British Red Cross Society and the Order of St. John of Jerusalem, her Grace Katharine Duchess of Westminster, is making an appeal for contributions to the great annual efforts to aid these great objects and known as “Our Day.” […] There are in the county over 70 Red Cross and St. John hospitals […] During the year 1916 alone no less than £53,000 was contributed by the county towards the upkeep of its 70 hospitals, and 13,500 patients were treated. […] On Thursday, October 18th, a special service will be held in the cathedral at 2.30 p.m., […] In the evening a concert will be given in the Town Hall at eight o’clock. The artists will include: Dr. Collisson and Mr. Percy French, in their celebrated entertainment, as given through the United States of America and Canada, and the “Whizz-bang” local celebrities. Hope, Hester and their fellow celebrities were doubtless among the large number (about 500) of “V.A.D. nurses of the British Red Cross Society and the Order of St. John from all over Cheshire” who attended the Cathedral service before the evening concert. As the war went on, so the show went on. In November 1917 an “excellent concert” was given at the Helsby Hospital by “Mr. Jefferson Hope and the Whizz-bang party, of Chester.” In the programme were songs, duets and dances, which were “highly appreciated by the audience.” The “Celebrated ‘WHIZZ-BANGS’” also performed that month at a sale of work to raise money for the Chester Royal Infirmary Linen League. On 25 Jan 1918 “the celebrated ‘Whizz-Bang’ Pierrot Troupe, consisting of Misses Atcherley, H. M. Giles, G. Grantham, J. Gamon, Joliffe, H. C. Huleatt, Napier, and D. Ward” gave their “excellent Entertainment, which [had] been enjoyed by numerous audiences everywhere throughout the provinces where they [had] appeared.” This performance was in aid of Lady Arthur Grosvenor’s Oakfield Upton Hospital. At least one of the Atcherley sisters visited the hospital itself in July 1918, when a sale of work and garden party took place to generate further financial support. In “a programme of competitions for nurses and soldiers, which caused great amusement and interest”, third place in the needle and thread race for nurses and wounded was taken by “Nurse Atcherley and Lance-Cpl. Topping”. Wounded soldiers were the focus of the Whizz Bang troupe’s in February 1918. 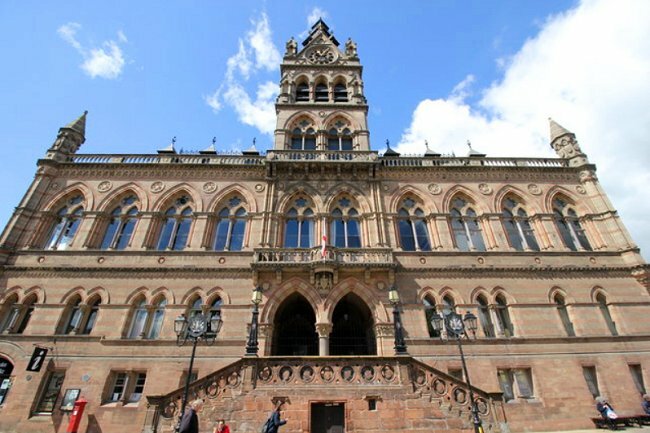 The ladies put on another performance at Chester Town Hall (pictured above) to “raise funds urgently needed to carry on the Transport of Wounded Soldiers to and from Local Hospitals by the British Red Cross Transport Cheshire 7/T (Chester City Div. ).” And, no doubt by popular demand, a return to the hospital at Helsby was made to entertain troops recovering from their war wounds. 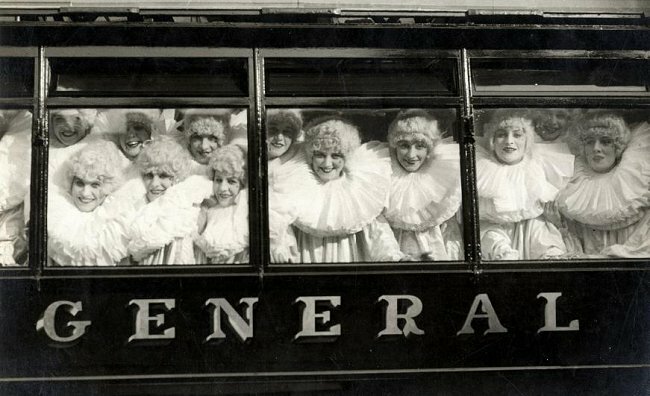 I have found no further mention of the Whizz Bangs of Chester after February 1918, and the members of the troupe probably hung up their Pierrot (or Pierrette) costumes when the Great War ended in Europe in November that year. Of course even then there were still many wounded who needed ongoing care – and one or both of the Atcherley sisters were there to lend support. In December 1918 for example, a performance by a concert party from Liverpool took place in Chester “to provide Christmas comforts for the wounded soldiers at the Chester War Hospital”. Amongst a “very charming bevy of ladies” who “raised quite a considerable sum by the sale of the very elegantly designed programme” was a Miss Atcherley. What a contribution Hope and Hester Atcherley made on the Home Front – on stage and in hospitals, they gave their all. Their lives were less eventful after the hard work and, I daresay, excitement of 1914-18, and the sisters enjoyed a time of peace which lasted for some twenty years. Then, an even more devastating conflict began – the Second World War. > Forward to Hope and Hester Atcherley’s World War Two. Picture credits. Whizz Bangs concert party advertisement board, Fonquevillers, 1916: Photo © IWM (Q 1633), taken from the IWM website and used under the terms of the IWM Non Commercial Licence. Pierrettes: Adapted from a photo taken from the Dutch Nationaal Archief Flickr photostream; no known copyright restrictions. Chester Town Hall: Photo © Copyright Jeff Buck, taken from Geograph and adapted, used and made available for re-use under the terms of a Creative Commons licence. Chester Chronicle, 31 Jul 1915, page 5. Copy viewed at Findmypast / British Newspaper Archive. Christmas on the Western Front, 1914-1918. At: The Imperial War Museums website (accessed 30 Nov 2017). Chester Chronicle, 26 Feb 1916, page 5. “GIRL GUIDES’ ENTERTAINMENT.” Copy viewed at Findmypast. Cheshire Observer, 3 Mar 1917, page 8. “HOSPITAL ENTERTAINMENT.” Copy viewed at Findmypast. Chester Chronicle, 3 Mar 1917, page 6. “CONCERT.” Copy viewed at Findmypast. Chester Chronicle, 7 Apr 1917, page 8. “THE ‘WHIZZ BANGS.’” Copy viewed at British Newspaper Archive. Cheshire Observer, 7 Apr 1917, page 1. “TOWN HALL, CHESTER. A GRAND ENTERTAINMENT”. Copy viewed at Findmypast. Chester Chronicle 2 Jun 1917, page 5. “THE WHIZZ BANGS.” Copy viewed at Findmypast. Cheshire Observer, 9 Jun 1917, page 1. “CONCERT BY THE WHIZZ BANG PIERROT TROUPE”. Copy viewed at Findmypast. Nantwich Guardian, 5 Oct 1917, page 2. “RED CROSS WORK IN CHESHIRE.” Copy viewed at Findmypast. Nantwich Guardian, 26 Oct 1917, page 2. “’OUR DAY’ AT CHESTER”. Copy viewed at Findmypast. Chester Chronicle, 17 Nov 1917, page 6. “Helsby.” Copy viewed at Findmypast. Chester Chronicle, 17 Nov 1917, page 1. “CHESTER ROYAL INFIRMARY.” Copy viewed at Findmypast. Chester Chronicle, 19 Jan 1918, page 1. “A GRAND CONCERT”. Copy viewed at Findmypast. Chester Chronicle, 27 Jul 1918, page 4. “LADY ARTHUR GROSVENOR’S HOSPITAL FETE.” Copy viewed at Findmypast. Chester Chronicle, 9 Feb 1918, page 6. “HELSBY. […] THE HOSPITAL.” Copy viewed at Findmypast. Chester Chronicle, 21 Dec 1918, page 5. “CHESTER WAR HOSPITALS.” Copy viewed at Findmypast. British Red Cross. Personnel record card for Mary Elizabeth Hope Atcherley. Copy viewed at British Red Cross website. Miss Clay (ed.) (1918), Have Mynde, The Queen’s School Annual, June 1918. Copy downloaded from The Queen’s School website’s Have Mynde archive.